This biography of Henry David Thoreau for children was excerpted from Mary Stoyell Stimpson's book, A Child's Book of American Biography (1915). Add over one hundred years to Ms. Stimpson's time reference when you read it with your own children. Concord, Massachusetts, is one of the New England towns that everybody likes to visit. When tourists reach Boston they usually make a point of going to Concord, either by electric or steam train, because they have read about its famous battle ground, where the first British soldiers fell in the great Revolutionary War, and because they want to see the very house in which Louisa May Alcott wrote Little Women, and the homes of Hawthorne, Emerson, and Thoreau. Henry Thoreau, who was born in Concord, loved the town so well that he spent most of his life tramping through its fields and forests. You might say the business of his life was walking, for he never had any real profession, and he walked from four to eight hours a day—across lots, too. He used to say roads were made for horses and business men. "Why, what would become of us," he would ask, "if we walked only in a garden or a mall? What should we see?" When Mr. Thoreau started out for a long saunter in the woods, he wore a wide-brimmed straw hat, stout shoes, and strong gray trousers that would not show spots too easily, and would stand tree-climbing. Under his arm he usually carried an old music book in which to press plants, and in his pocket he kept a pencil, his diary, a microscope, a jack-knife, and a ball of twine. He and a friend, William Ellery Channing, agreed that a week's camping was more fun than all the books in the world. Once they tried tramping and camping in Canada. They wore overalls most of the time, and wishing not to be bothered with trunks or suitcases, they tied a few changes of clothing in bundles, and each man took an umbrella. They called themselves "Knights of the Umbrella and Bundle." The Thoreaus were rather a prominent family in Concord. There were six of them, all told. The father, Mr. John Thoreau, was a pencil-maker. A hundred years ago this was a trade that brought good money. 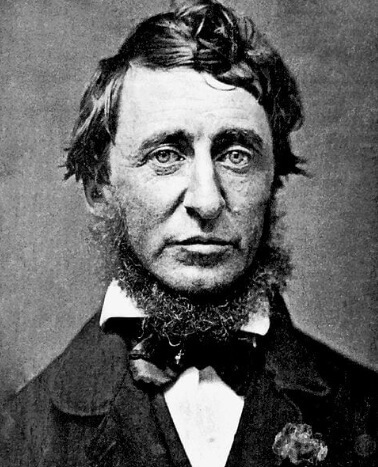 Mr. Thoreau could turn out a great many pencils because all the children helped him make them. He was a small man, quite deaf, and very shy. He did not talk much. But his wife, Mrs. Cynthia Thoreau, who was half a head taller than he, could, and did, talk enough for both. She was handsome, wide-awake, and had a strong, sweet, singing voice. She took part in all the merry-makings and also in all the church affairs in Concord. She was bitter against slavery. She used to call meetings at her house to talk over ways of putting an end to it, and when slaves ran away from the South, she often hid them in her home and helped them get further away. She knew a great deal about nature, bought a good many books for her children, and was determined that they should have good educations. Henry, his brother John, and the two sisters, Helen and Sophia, all taught school. And Helen helped Henry earn money to go to Harvard College. The whole Thoreau family were proud of Henry, and his mother never tired of telling what fine letters and essays he could write. She and Sophia went one day to call on an aunt of Ralph Waldo Emerson's, Miss Mary Emerson, who was eighty-four. Mrs. Thoreau began to talk about Henry right away. Miss Emerson nodded her head and said: "Very true," now and then, but kept her eyes shut every minute her callers stayed. When they rose to go, Miss Emerson said: "Perhaps you noticed, Mrs. Thoreau, that I kept my eyes closed during your call. I did so because I did not wish to look on the ribbons you are wearing—so unsuitable for a child of God and a woman of your years!" Poor Mrs. Thoreau was seventy, and her bonnet was as bright and gay as it had been possible to buy, for she loved rich colors and silks and velvets. She did not mind Miss Emerson's rebuke a bit, but Sophia stuffed her handkerchief in her mouth to keep from laughing aloud. When Henry was a boy, he used to delight in his Uncle Charles Dunbar, who paid the family a visit every year. Mr. Dunbar was not a worker like his sister, Cynthia Thoreau. He did not have any business but drifted about the country, living by his wits. One of his favorite tricks was to pretend to swallow all the knives and forks, and a plate or two, at a tavern, and offer to give them back if the landlord would not charge for his dinner. He was a great wrestler and could do sleight-of-hand tricks. Henry used to watch him and ask question after question, and he learned how to do a few tricks himself. Just as his mother hoped, when Henry grew up, he decided to be a writer. To be sure he taught school a while and gave lectures which people did not understand very well, for he had strange ideas for those times, but he wrote page after page, sitting in the woods, and liked that better than all else. He first wrote an account of a week's trip on the Concord and Merrimac rivers. This book did not sell very well, and one time he carried home from the publishers seven hundred copies that no one would buy, saying: "Well, I have quite a respectably sized library now—all my own writing, too!" But four or five years later Thoreau built a hut on the shore of Walden Pond and lived there all alone, like a hermit, for two years. He did this for two reasons: because he wanted to prove that people spend too much time and money on food and clothes and because he wanted a perfectly quiet chance, with no neighbors running in, to write more books. He said he spent but one hundred dollars a year while he lived in this hut. He raised beans on his land, ate wild berries, caught fish—and "went visiting" now and then. I should not wonder if he often took a second helping of food, when visiting. To buy his woodsman's clothes and a few necessities, he planted gardens, painted houses, and cut wood for his friends. He wrote a book called Walden which tells all about these seven or eight hundred days he went a-hermiting, and after that, several other books. These sold very well. In all of them he was rather fond of boasting that he had found the only sensible way to live. "I am for simple living," he would say, and always was declaring "I love to be ALONE!" But sometimes people passing by the pond used to hear him whistling old ballads, or playing very softly and beautifully on a flute, and they thought he sounded lonely. Although he makes you feel, when you read his books, that it is fine to roam the fields, sniffing the wild grape and the yellow violets, and that no one can find pleasure like the man who rows, and skates, and swims, and tills the soil, yet the question is bound to come: "Is a man all alone in a hut any better off than a jolly father in a big house, playing games with his children?" Let me tell you, too, that after all Thoreau's talk about wanting to be alone, the last year he lived in the hut, he used to steal off, just at twilight, to a neighbor's house where there were little children. While they curled up on a rug, in front of the open fire, he would draw near in a big rocking-chair and sit for an hour or more telling them stories of his childhood. He would pop corn, make whistles for them with his jack-knife, or, best of all, do some of the juggling tricks, which he had learned, as a boy, from his uncle Charles. And one day he appeared at the door with a hay-rack to give them a ride. He had covered the bottom of the rack with deep hay, then spread a buffalo robe over the hay to make it comfortable. He sat on a board placed across the front and drove the span of horses, and as he drove, he told funny stories and sang songs till the children thought a hermit was a pretty good sort of a chum. The hut went to pieces years ago, and only a pile of stones marks the place where it stood, but if you go to Concord, you will find a pleasant street named for Thoreau, and the house in which he lived the last twelve years of his life, half hidden by tall trees. And also you can read his books and learn how he enjoyed the woods and what beautiful things he found in them. Add Henry David Thoreau: A Child's Biography to your own personal library.